The violin is a beautiful wooden instrument with a rich tone and a wide range of pitch. It can have different musical voices depending on the techniques used. It is the first-ever instrument that I learned (the annoyingly squeaky plastic recorder doesn’t count!). I started violin lessons through my elementary school when I was in third grade. To be honest, I only started lessons to get out of being in class! When I first started playing, I was not very good. In fact, I was quite awful! When my bow hit the strings it sounded scratchy and out of tune. But once I started taking additional lessons outside of school I could see myself starting to improve. Soon, I started to really love practicing. I thought it was awesome how I could play my favorite Christmas and Hanukkah music, Irish fiddle music, and Hot Cross Buns. Day by day my tone and pitch improved. Before I knew it I was rising to the front of the school orchestra, auditioning for other groups, and playing solos at recitals. But with this came stress: I wanted to be the best and thus violin practicing become frustrating. Though I was fueled by the competition it also made my stomach hurt. I just wanted to sound absolutely perfect. I shortly realized that I missed having fun while practicing violin. I started to think about my future and saw that being a professional violinist was not the life for me. That life is extremely competitive. I wanted playing the violin to be a fun hobby like it used to be. I quit my violin lessons. They always made me feel stressed because my teacher demanded perfection. I know she just wanted my playing to improve, but it was at the cost of my mental health. By this point, I was starting high school. In school, I played in the big orchestra. This was the perfect environment for me, the music was slightly challenging but not too difficult, I was surrounded by kind others in the middle-back of the orchestra who played just as a hobby, and most importantly it was fun. 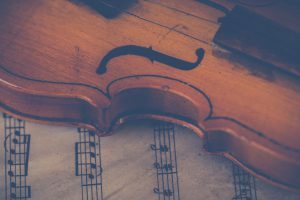 There were still orchestra elites—the top students who practiced for hours every day, sat in the front of the orchestra and planned to become professionals—but I was not one of them or jealous of them because I finally felt that music made me happy. I realized that finding a balance is important. You do not need to be the best! And never forget that your mental health comes first. Do what you love and be happy. What instruments have you played? Does playing your instrument make you calm? Has practicing your instrument caused you anxiety? Let us know in the comments!